Вітаємо Вас на головній сторінці Українського часу! Радіопрограми УКРAЇНCЬКИЙ ЧAC Ви зможете послухати на YouTube каналі: УКРAЇНCЬКИЙ ЧAC - UKRAINIAN TIME - LE TEMPS UKRAINIEN. 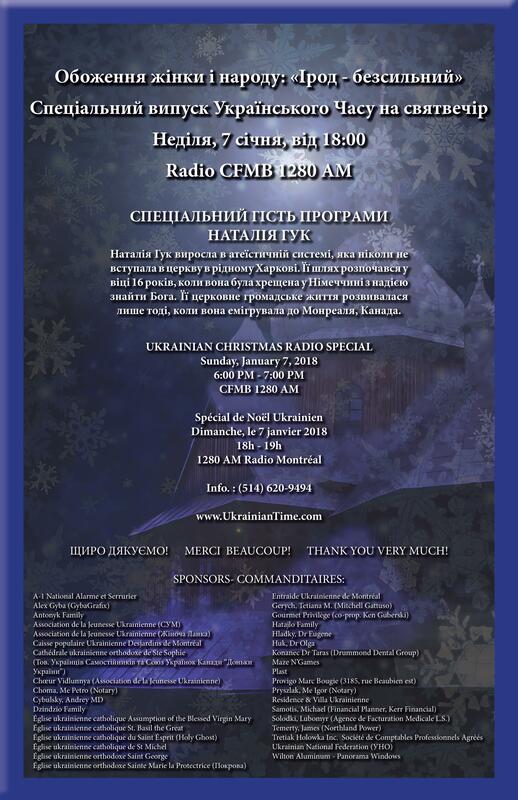 Welcome to the UKRAINIAN TIME home page! УКРAЇНCЬКИЙ ЧAC - UKRAINIAN TIME - LE TEMPS UKRAINIEN. Bienvenue à la page d'accueil du TEMPS UKRAINIEN! Cпеціальний гість програми - Оксана Шак, з якою отець Ігор Куташ веде розмову про розвиток її діяльної участі в Церкві Христовій, після прийняття Святого Таїнства Хрещення вже в свідомому віці за своїм власним бажанням. Thanks to all our weekly advertisers who also ensure that the show goes on. Please do thank them when given a chance. Oxana Senkiv, Lina Gavrilova, Pavlo Zabigailo, Fr Ihor Kutash, Natalia Fedosieieva and Fr Ihor Oshchipko (Assumption of the Blessed Virgin Mary Ukrainian Catholic Church). Also, a special thank you to Oksana Shak, our featured special guest. We are grateful to His Grace Andriy (Ukrainian Orthodox Church of Canada) & His Grace Stephen (Chmilar) (Ukrainian Catholic Church of Canada) for their pastoral greetings. A special thank you to: Alex Gyba (GybaGrafix), Orest Vankevich (Ukrainian Youth Association - "SUM"), Yourko Kulycky and the team of dedicated employees at the Caisse populaire Ukrainienne Desjardins de Montréal, Helena Waverchuck, Melodia Kouklewsky, Helen Holowka, Zorianna Hrycenko-Luhovy & Bohdanna Hawryluk (UCC Montreal), Dr. Artem Luhovy (Ukrainian National Federation). 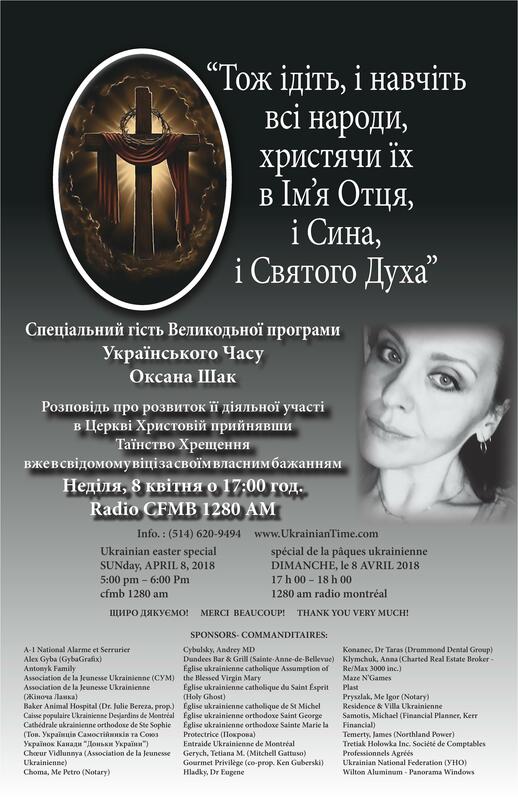 A very special thank you to Luc Gingras (Alfred Dallaire MEMORIA), the Temerty Family, the administration of BBC (Ukrainian Section), Deutche Welle BBC (Ukrainian Section), Channel 5, Radio Liberty, Voice of America, Unian, Ukinform, Lvivsky Zamok, Novy Kanal, Ukrayinska Pravda, Den', RISU, Vidia. 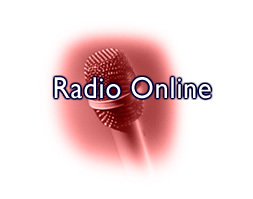 Thanks to the folks at Radio CFMB: Luigi Valente, Alex Fortino, as well as the personnel at Evanov Radio Group. Thank you to all those not mentioned, but who have contributed. We also thank all our listeners, who provide an important audience. We very much appreciate your guidance, criticisms and praises. Cпеціальний гість програми - Наталія Гук виросла в атеїстичній системі, яка ніколи не вступала в церкву в рідному Харкові. Її шлях розпочався у віці 16 років, коли вона була хрещена у Німеччині з надією знайти Бога. Її церковне громадське життя розвивалася лише тоді, коли вона емігрувала до Монреаля, Канада. If you have news items of interest to the local Ukrainian community, please let us know. Copyright 2004 George Black Promotions Inc.
Радіопередача УЧ 19 вересня 2015 року.